This odd but lovely year is continuing. At the start of October I was sitting out in warm sunlight and even starlight, and most of the trees were still green. I guess October will come in November just as May came in June this year! Experts are predicting a good leaf colour, following the good summer, so I hope we have it by the time you read this. When we get to November, we want comforting, warming food. And, just as the summer lettuce, peppers and tomatoes seem to suit that season, so the seasonal vegetables of November are perfect for autumn. I have heard tales of people ordering veg boxes and then wondering what to do with that great football-sized celeriac that turns up, but I wouldn’t want to be without roots and tubers and some of the late squashes and pumpkins that are around now. We have always eaten roots as a source of carbohydrates, but they were mostly puny little things compared with the ones we eat now. Wild carrot and wild parsnip are clear forebears of our present day roots: selective breeding means they are now big and beautiful. However, archaebotanists (yes, they do exist!) have found evidence of us eating the roots of all kind of wild plants in ancient times. Biennial plants are especially good: you take the well-formed roots at the end of their first year of growth before all the energy goes into the production of flowers. Edible roots were from plants as various as sea beet, marsh mallow, wood sorrel, pignut, chicory, goat’s beard and solomon’s seal. Especially common were dandelion and silverweed. The latter is described as particularly delicious and was known as the “famine plant” in Scotland, used until recent times. Cultivated roots were a real mainstay of people’s autumn and winter diets in previous centuries. In more recent times they went out of fashion a bit: you won’t find much on parsnips and swedes in Elizabeth David or any of the other cookery writers who influenced our French-style “fine cuisine” in the mid-20th century. However, they have now had a revival as particularly British delights, coming from the cookery of poorer people. You will now find them on the menus of posh restaurants and on high-end cookery shows on television. One of the delights of shopping at local farmers’ markets and real farm shops is to get good fresh carrots. They taste wonderful compared with the standard supermarket ones. Originally carrots were a dull purplish colour: the orange variety was particularly developed during the reign of William of Orange as being more patriotic! Now you can occasionally get the older purple, even blackish, ones, and yellow ones too. 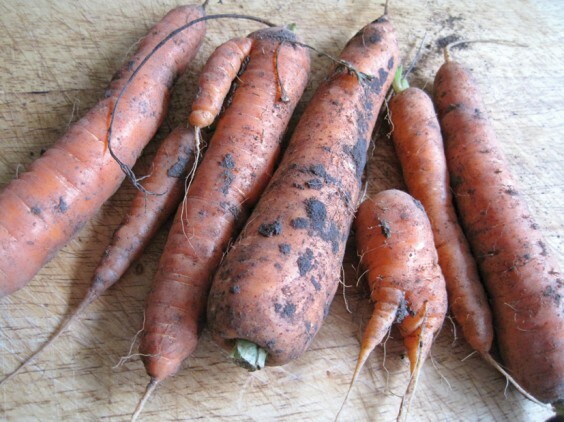 Carrots are fairly high in sugar so they caramelise very well when roasted or fried. One food we take for granted is the humble spud. Potatoes came over here from South America during the Elizabethan period. They quickly became the main starch food of ordinary people, and there was starvation if the potato harvest failed. During the 20th century we lost a lot of our interesting varieties, going for a few reliable ones like King Edward or Majestic or more recently Charlotte, but the old ones have gradually come back. You can get wonderful black, blue and red varieties, though you’ll probably have to grow your own. The delicious fir apple pink is available from farmers’ markets, though. In South America there are still hundreds of different potato varieties, and it’s worth searching out the best here. Parsnips are underrated everywhere except here – the French hardly know them. They are very sweet and roast wonderfully. During the Second World War they were often used to replace fruit in jams and puddings; not necessarily recommended, but you can make good use of their sweetness. Beetroot are similarly sweet. Young ones are lovely grated raw, but the bigger ones you get at this time of year do need cooking. But there are lots of ways to use them, including roasting, not just boiling and putting in salads. These are old foods, used for centuries. Carrots, parsnips and beetroot can all be used in cake making. There are some great recipes for dark beetroot-and-chocolate cakes. Everyone knows carrot cake now, and carrots are often put into Christmas puddings (which you should be making soon). Parsnips can be used similarly in cakes and sweet puddings. Celeriac looks daunting, but you can cook it (or grate it raw) like any other root. I think swedes are better-flavoured than the white turnips, despite their being at one time more of an animal food. The squashes, which are often cooked in similar ways, include the popular butternut, being cultivated now in the UK, but there are also pumpkins and lots of others. This autumn the farm shops and markets are full of multicoloured squashes, all subtly different. They keep really well, too. They were once a very important food world-wide, often being forgotten in days of intensive agriculture, and fit in well with traditional growing techniques and permaculture. And, of course, we have the edible bulbs too – onions, garlic and leeks – ancient foods, mentioned in Chaucer, and great with the roots and squashes. They are good at this time of year, and throughout the winter. In recent times the sweet potato has become popular here, often recommended as a healthy substitute for potato, though I’m not sure it is much different in that respect. Ordinary potatoes are quite high in nutrients too, and it’s often the way of cooking that makes them unhealthy! Sweet potatoes taste good and are easy to cook in “English” styles, despite not growing well in our climate. Roots, tubers and squashes can all be treated in broadly the same way. You can boil or steam them, mash them, roast them, or make soup, for a start. And they mix well together. Roast vegetables are a great feature of late autumn and winter food. You can do them all on one tray, with some nice local rapeseed oil, in a medium-hot oven. Parboil some vegetables like potatoes and swedes, and put the others in raw, all in similar sized chunks, sprinkle with salt, pepper and some seasonal herbs (rosemary, sage, thyme or bay are perfect), stick them in the oven and leave them to it! Or to be super-healthy, bake potatoes plain in their jackets and then serve with some local cheese, maybe with some steamed swede or sweet potato mashed in as well, plenty of pepper, maybe some ginger…. Making mashes or soups is almost the same thing – you can use the same combinations of vegetables. For a mash, steaming is better than boiling, and mixed veg are much nicer than plain potatoes. Celeriac or parsnip or swede (or all three!) go particularly well with potato, especially with a little onion, leek or garlic included. If you are trying not to use butter in your diet, mash them with a little rapeseed or olive oil and a drop of milk, and plenty of pepper. Celeriac, swede, parsnip or butternut squash also each make wonderful mashes on their own. You can experiment with adding spices: nutmeg is particularly nice, and so is grated ginger. Mashes make one of our lovely comfort foods, the shepherd’s or cottage pie. Shepherd’s pie of course has lamb or mutton, and cottage has beef. But of course you can use any minced or finely chopped meat for hunter’s pies (rabbit, pheasant), or swineherd’s pie (pork). Use one of the mixed vegetable mashes for a topping. Lightly cook raw meat, season and add a little liquid – or chop or mince leftover cooked meat and add some gravy. Pile the mash on, add grated cheese if you want, and put in a hot oven to brown. Fish pie too is now quite a gourmet dish. I remember a wonderful one in a pub in Port Isaac – mixed fish in a creamy white sauce topped with rough mash. For a soup, I start off by gently frying some onion or leek till it is just soft, then adding a combination of chopped seasonal vegetables. Squash, parsnip, potato and carrot all go well in soups. Add some liquid and cook briefly till everything is soft – you don’t have to boil it to death. Then you can blend it, or leave it in chunks, or a bit of each. The liquid matters. There’s no point having lovely fresh vegetables and adding stock cubes made of all kinds of e-numbers and sugar and high salt content. You can get good stock cubes, or even better use stock made from boiling up bones from chicken or other meats, or bits of veg. You can use wine. You can even use plain water if your vegetables are tasty enough. Whatever you do, watch the seasoning: not too salty but plenty of pepper. Again you can try spices. Ginger is lovely with butternut or parsnip, and coriander is now traditional with carrot. Adding coconut milk at the end is also lovely. You can also add a few greens at the last minute to soups – spinach or kale or broccoli – for an even more balanced meal. Sprinkling cheese on top is good. The traditional French onion soup is made by stewing onion in oil or butter for a long time until golden, cooking in some good stock, floating slices of bread and a good strong grated cheese on top, and grilling. A meal on its own! You can make soup easily from almost any vegetables. Make it as thick or thin as you like, adding cheese or bacon or other meats, and it is guaranteed to be cheap, tasty and far more satisfying than anything you can buy ready-made. It takes a little while, but most of it can happen while you’re doing something else! Eat it with good wholemeal bread, or wholemeal cheese scones, and it will do you good as well as comforting you. At one time, vegetables like this were the main food of ordinary people, especially when grain prices were high or there was a bad harvest. Everyone had their own vegetable plot, and vegetables were carefully stored over the winter. Farmers grew rather more, and sold them locally, alongside vegetables they grew to feed their cattle (mangels, fodder beet and swedes) – sometimes they were food for both! Generally, though, it was not done on a large scale until the 20th century. Then, parts of the country with good rich soils, or light easily-dug soils, began to specialise in potatoes or other vegetables. Now there are huge commercial crops, many grown under polytunnels to get them early and protect them. But it’s one thing where ordinary people still like to grow their own, as witnessed by the rows of potatoes in the new Alvechurch allotments, and the entries in local produce shows. Many of the flowers of these plants are good for insects like bees, though most growers don’t want too many other insects about! They can be rotated with other plants to help provide a balanced soil and environment. Huge fields of just one crop are not quite so environmentally friendly, but the kind of mixed growing you get round here is generally fine. You can grow them on a small scale among flowers or in big bags or raised beds – you don’t need a separate vegetable garden. I hope they continue to thrive in the villages and countryside. My poem this week is about a different kind of roots – my own! I step outside, soft leaf mould. With an overtone of cow and silage. Cold houses and the oil lamp in the toilet. And, very occasionally, new paint. Remembered hills, or land of their mothers. To city to city to country - then stop. Around my heart and brain. It smells of home.